Thyme for Cooking easy recipes: Lentil and Brown Rice Stew with Sausages. Brown rice and lentils.... How healthy can we get? Well, except for the sausages.... Use turkey. 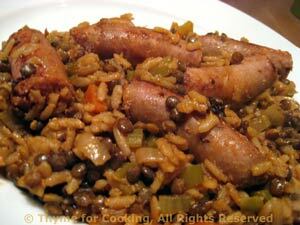 I use the small, green or black lentils and I think their flavor goes well with both a hearty rice and the sausage. You could substitute tan lentils but not the red ones as they don't hold their shape. When sausages are done, cover, remove from heat.